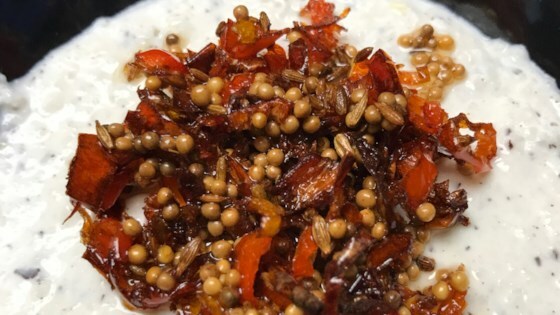 "Indian coconut chutney to be served with dosa and idli (steamed rice and lentil cakes)." Place the coconut and yogurt in a blender or food processor. Process to a paste-like consistency. Transfer to a medium bowl. Heat the oil in a medium saucepan over medium heat. Stir in chili peppers, mustard seed, and cumin seeds. Cook until mustard seeds start to pop. Spoon over the coconut mixture. Cover, and refrigerate until serving. Try this side dish prepared with jasmine rice and coconut milk. There is something called "Dalia" available in Indian stores which is basically roasted split chickpeas. Adds a lot to taste and also some curry leaves. May take alitle time to shred the coconut,but it is SO WORTH IT! I served it with papadaums. Wonderful sweet-not too spicey-delight! I used 1 dried red chili pepper instead of the fresh kind, and loved this! Next time I will definitely try to get the fresh peppers!